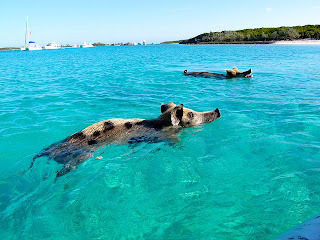 The Exuma Cays may well be one of the most beautiful cruising grounds we have ever experienced. Beginning with Sail Rocks and Ship Channel Cay, just slightly south and east of Nassau, the Exumas stretch down to Great and Little Exuma to the southwest. 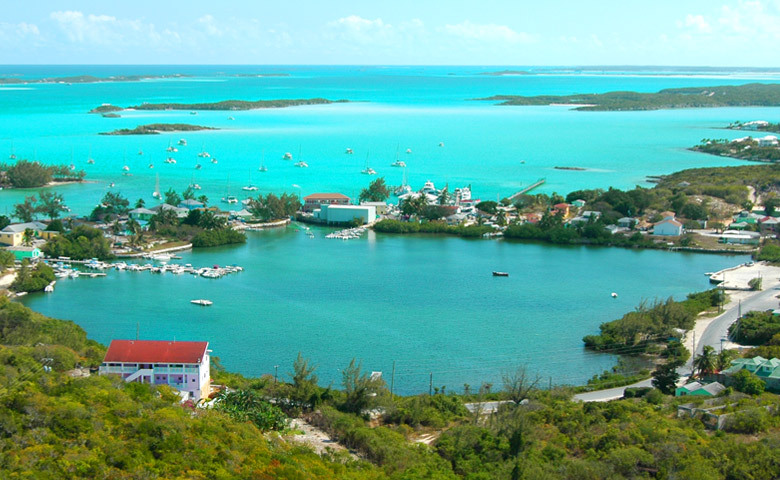 The Exumas offer anything from remote anchorages, to small settlements, to busy towns like Georgetown. Many cays offer fabulous beaches, unusual wildlife and some of the greatest anchorages you may ever experience. It has been a great joy to be able to experience this wonderful cruising ground once again as we continue our research for the next edition in our Great Book Of Anchorages series, the Bahamas Edition. Someone pointed out to us that there is just no way we can call this work, so we won't try. The road most traveled by a majority of cruisers is to head south from Nassau, across the Yellow Banks and then southwest to Allans Cay. The anchorage is between Allans and Leaf Cay. The currents here are strong so either two anchors are needed or you need an anchor that will reset well in reversing conditions. Dinghy in to Leaf Cay and say hello to the native iguanas. When seas are up in Exuma Sound, the deep water side of the Exumas, a surge can work into the anchorage that can make it uncomfortable. 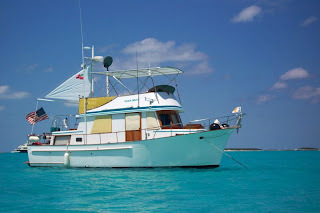 Deeper draft boats may have to anchor in the cut at the south end of Leaf Cay or off the west side of the Cays if there is no westerly component to the wind. From Allans it's just a short hop to Highbourne Cay if a marina is needed. There are some supplies sold at Highbourne. Be aware that a strong surge can work in around to the west side of Highbourne and make this a very uncomfortable anchorage. 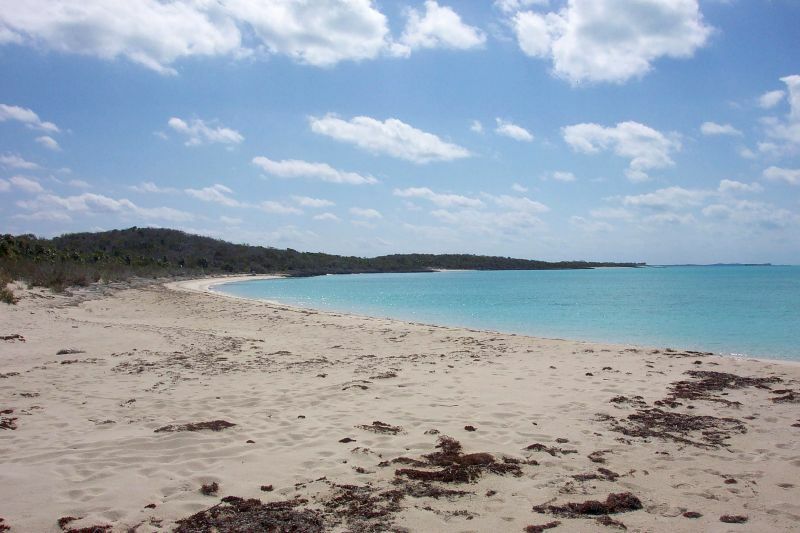 There are many, many, opportunities for some wonderful stops south of Highbourne Cay. Normans Cay is another very popular stop with some good snorkeling. There is a wrecked drug lord's plane in the lagoon, but not much of it is left. We visited when a good portion of the plane was intact and the old mansion was still in fair shape. But it's still fun for a day or two. There is a very good anchorage on the west side of Norman's in prevailing winds. There is a beach bar on Normans that has a very good cheeseburger in paradise. 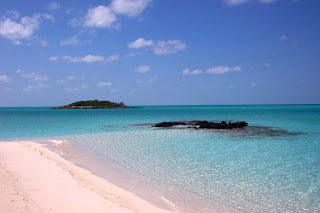 From Normans, the anchorages at Shroud Cay and Hawksbill Cay are indescribable. The crystal clear water, outstanding snorkeling and white beaches are all must visits. Wax Cay marks the northern boundary of the Exuma Land and Sea Park. The Park is a no-take zone and that means, fish, shells, coral or ANYTHING. Stiff fines can be levied if you're caught with anything and the Park Wardens are always on the lookout. We were a bit disappointed on our recent visit. We almost felt like we were back in south Florida in one of the areas that require you to take a mooring. The north anchorage has always had moorings and we have used them in the past. But recently moorings have been added in one of the other popular areas where boats would often anchor (near Emerald Rock). We can understand moorings to protect the coral in the park, but this new area has nothing more than a sandy bottom. There are buoys installed as markers and all boats must anchor west of these marker buoys. As a result, you are forced to anchor farther out in much more exposed areas, or take a mooring. The moorings are not free and we felt we were being punished for not taking one since we were also told that the Park would not share their paid wifi with us unless we took a mooring. We have never experienced this in the Bahamas anywhere else. But we did enjoy our time there, and it's still one of the most beautiful cruising areas anywhere. The upside is the mooring fees are used to pay park employees and upkeep of the park. Park boundaries extend south to about Little Bell Island and Conch Cut. 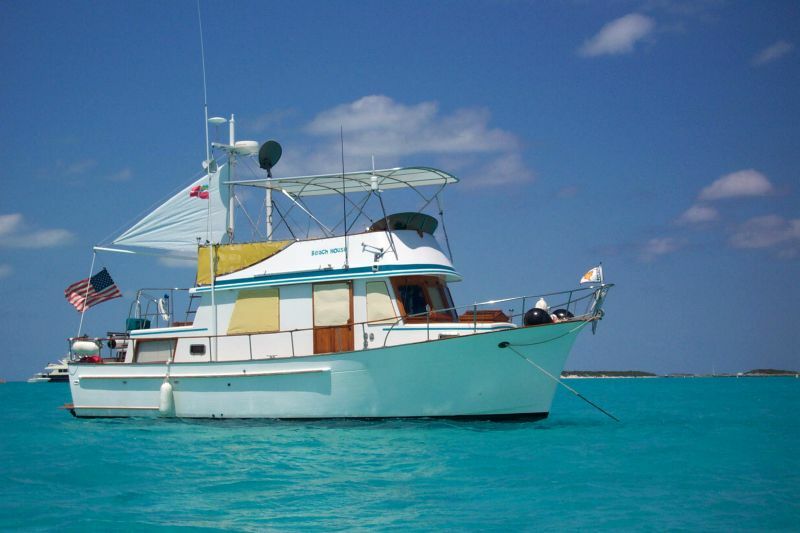 Boats with deeper drafts can continue south on the banks, and the next popular stop is the Sampson and Staniel Cay area. There is a marina at Sampson with a restaurant that is by reservation only. You need to tell them what you want to eat and how many people there will be so they'll know what to cook. The marina also sells fuel if it's available. It is all expensive. Everyone's favorite is Staniel Cay and Big Majors Spot. Big Majors is where you can find the famous Pig Beach. 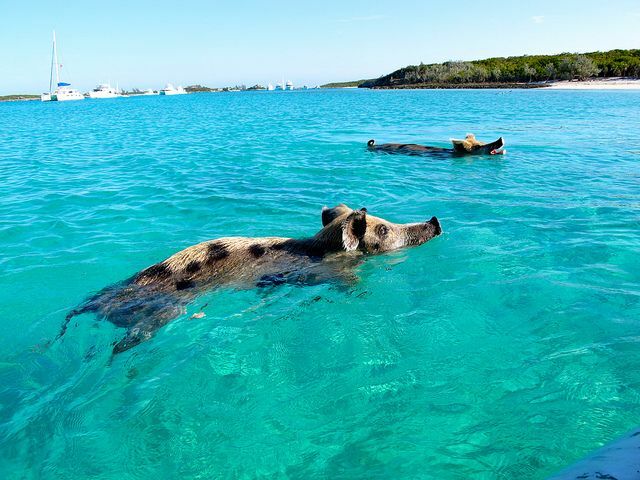 The pigs will see you coming in your dinghy and swim out to meet you. They expect something to eat and can get quite aggressive at times. It is indeed a sight to see and one you will always remember. Staniel Cay is a good spot to hang out for a while. The Yacht Club offers fuel, water at a price, and dockage if you need it. Ashore there is a restaurant, bakery and two small grocery stores. Snorkeling is excellent, especially at the Grotto where one of the James Bond movies, "Thunderball," was filmed. Farther south is one of our favorite settlements, Black Point. 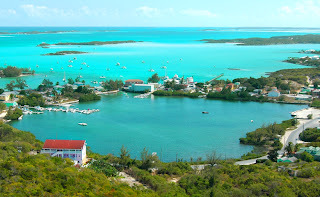 This is one of the largest settlement in the Exumas second only to Georgetown. The settlement is typical of the friendly Bahamas experience we have encountered everywhere we have been. There is a government dock where the supply boat lands and this is the best spot in which to anchor. Be sure and leave enough room for the supply boat; it's rather large. There is a community dock to land the dinghy. The settlement has a modern laundry, a cafe, several small groceries and free wifi at the cafe or near the church. You can often find ladies working their magic making baskets and all sorts of wares from straw and palm fronds. Don't bypass Black Point and plan to stay a while. From Black Point, Farmers Cay is another popular stop. There are occasionally festivals for special events at Farmers and there is a restaurant there, but we have never felt is was one of our must see places. 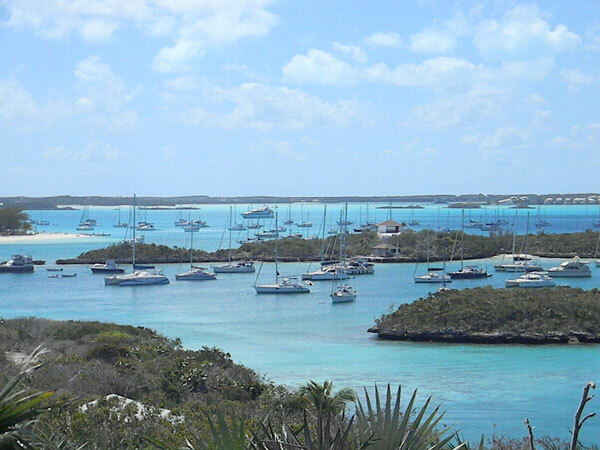 For deeper draft boats, Galliot Cut is the last opportunity to transit off the banks to the deep waters of the Exuma Sound. It's wise to keep a good eye on the weather before heading into the Sound; winds and seas can make for an uncomfortable trip. Under the wrong conditions, a rage can build in all the cuts and you can suddenly find yourself in some heavy weather with no place to go. For shoal-draft boats like Beach House, you can carry on farther south as far as Rat Cay Cut and stay in the more protected waters. All of the cuts in the Exumas can have strong currents depending on which way the tide is flowing. These currents need to be respected and planned for anytime you enter or exit the cuts. If a strong wind is opposing the currents, the cuts can become impassable. From Galliot Cut, the entrance at Elizabeth Harbor is about 34 miles. It's straightforward, and since the Sound is deep, there are no hazards to worry about as long as you stay a short distance off the outlying cays. The west entrance to the harbor is wide but can get very rough if winds and waves have been building. The Conch Cay light is obvious, but the transit of the harbor is not straightforward. Once off the Sound and moving toward the inner harbor, there are a number of shoals and coral heads to be avoided. A good set of charts, like Wavey Line, and close study BEFORE you get there will take some of the stress away. You will snake your way through until reaching the main anchorage area off Volleyball Beach or off the town. For many boaters, Georgetown is the Destination for the winter, and many boats come here year after year, spend months, and then return to their home countries. Which is unfortunate, since they bypass some really wonderful cruising grounds. Georgetown is indeed a cruising mecca. The boaters are always planning events, pot lucks on the beach, volleyball tournaments, fishing excursions, dinghy raft-ups and every imaginable reason for a get-together. Any kind of boating service is available, and supplies can either be easily found or fairly easily shipped in from the U.S. At least easy from Bahamas standards. The town is the largest settlement in the Exumas and has a variety of shops and restaurants and a well-stocked grocery store, Exuma Market. The market has a very large dinghy dock and it can get crowded. There is a water faucet on the dinghy dock for filling jerry jugs and the water quality is not bad, and best of all, it's free. In town you can find banks, dive shops and hotels, and there is a good airport for flying almost anywhere you might need to go in a hurry. It's also a good place to fly in friends and relatives so they can come and enjoy the Bahamas with you. There is an on-again, off-again marina that sells fuel and water and offers dockage when it's open. Out of town, there is a haul-out facility for repairs and bottom painting. Making preparations to return home is easy and one of the better locations. We always have to be careful when we go to Georgetown. It's one of those harbors that swallows your anchor and makes it very difficult to pull up and leave. This is the terminus where most boaters turn around to head north again. Beyond is the out-islands where most cruisers seldom go - the more remote parts of the Bahamas. What Do You Do Once Your In The Bahamas? Or go to the Categories listing on the left column and click on Bahamas.